Hi Pam, I’ve been a reader for quite a while, and LOVE your site! 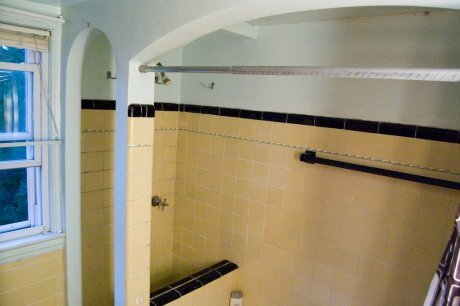 I also have a question: my bathroom has 2 showers — or originally, I guess it would have been a shower and a bath. 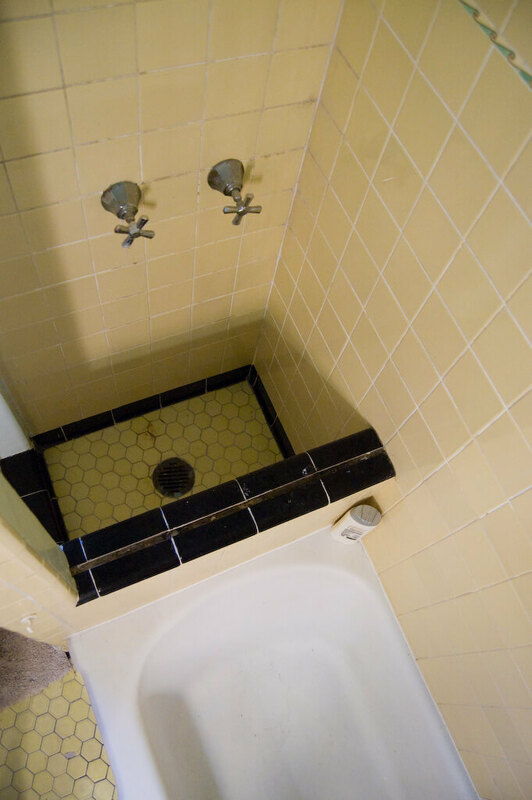 There’s a full-sized tub with a smaller, “attached” stall shower separated by a half-wall. 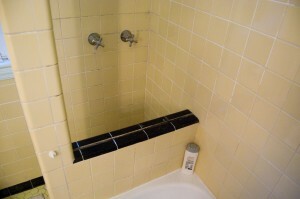 (Unfortunately, the little shower no longer works, so the tub is now the shower as well.) I’ve never seen anything like it before — have you?Also, now that you can see the small wall between the tub and the shower. There’s a gap along the top, where we think maybe a piece of glass used to be? We’re just not sure. I know you’ve mentioned on the blog before that wall-hung sinks with legs makes bathrooms appear bigger, and I couldn’t agree more! 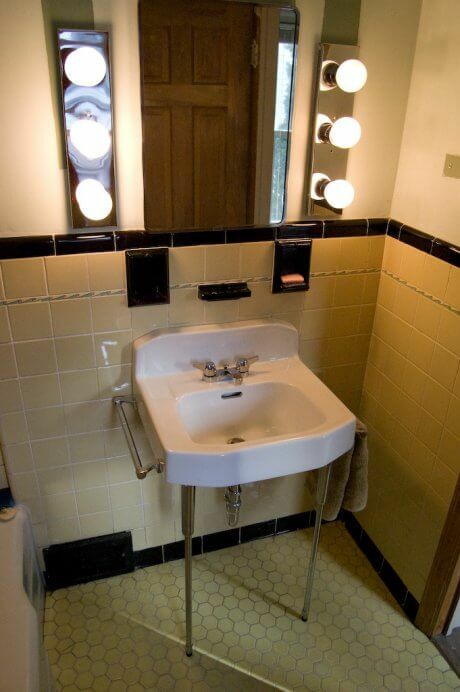 The vintage sink we installed is actually a little larger than the one we replaced, but the bathroom *definitely* feels much roomier without the vanity. The same thing happened once we recessed the medicine cabinet. The built-in toothbrush holder and soap holders really stand out, since the medicine cabinet is no longer hanging over them. We’re in Western New York. I bought the house when I came here 6 years ago for graduate school (PhD in English….still working on it!). 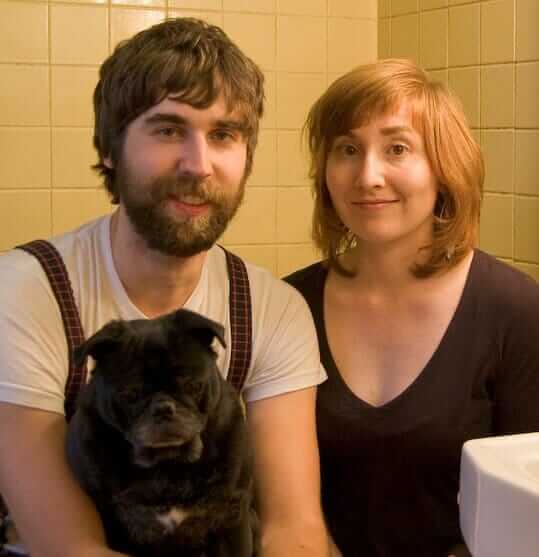 I met Brian after moving here, and he moved in about a year ago (he’s a graphic designer who works from home). We were recently visiting a local architectural salvage store (Rehouse) and saw some adorable vintage sinks for under a $100…that’s really what got us started! We realized that we HATED our particleboard vanity and sink-that-never-stayed-clean. We’re novice DIYers, but after some research, we felt like this could be a first real project – something we could actually afford and do ourselves! Replacing the sink is just the tip of the iceberg now, of course! We’re trying to decide about painting the walls, and we’ve re-sealed around the tub, but the grout in other places needs some work (not to mention the *other* areas in the house now begging for our attention!). But we’re really happy with the “new” sink and medicine cabinet — it dramatically changed the space and made it feel like an entirely new bathroom (for under $100!). 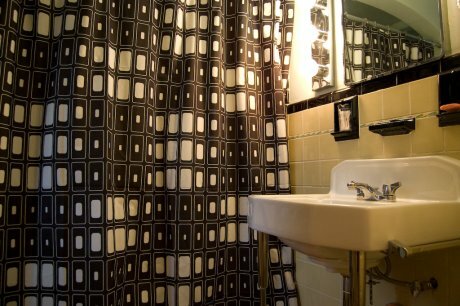 That’s our retro renovation story — for now, anyway! PS. We were at Rehouse this past weekend as well, and saw a new arrival — a set of metal cabinets (including two wall ovens) in TURQUOISE. It was gorgeous! They were GE, and although quite a few cabinets were there already, more were on the way. 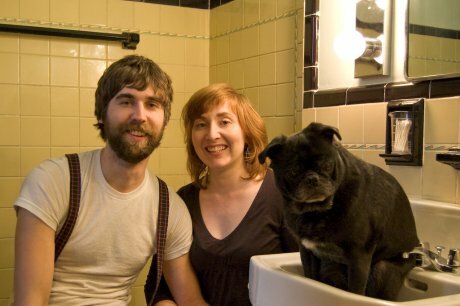 What a lovely bathroom, Rachel — and the wall hung sink on chromes legs looks amazing. That’s got to be the smallest shower enclosure I’ve ever seen! 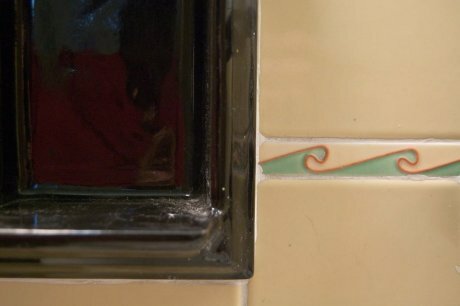 Judging from the tile work, it appears to be a “Well, we have an extra 24″ on this wall, what are we going to do with it?” kind of thing. I agree, probably had glass in the groove, but I didn’t see any mountings on the side walls. Definitely not stock, and at 6’1″, I’d have a really hard time getting into it. Also, Rachel, I see you shower curtain choice is definitely more graphical/modern, so I know that the wallpaper above is probably not to your taste! I like it, though — especially how it recognizes the strength of the black trim tile. Maybe all you really need now are coordinating towels and rugs — in green like the liner tile? — and some artwork on the walls that includes each and every color in the bathroom. If you want to go mod – maybe JennSki has a print up your alley? Thank you so much for sharing, and good luck with everything… just looking at you and Brian reminds me of my early married days and how much fun (yes!) Mr. Retro Renovation and I had, feathering the nest, renovating this and that. Happiness. Can some one tell me what you think the size of the hex floor tile is? I am debating between one inch and two inch….I like this one! I would wallpaper it in black and white, medium size pattern like the shower curtain, and the mini shower, I would fix for the dog!